Ranger01 started a poll The Green Hornet series MEGATHREAD! As it happens, I've just been re-reading a few of the old NOW Comics Green Hornets. The very first issue of their (Volume 1) Green Hornet series by Ron Fortier told the interesting, self-contained story of the original Green Hornet called "My Last Case". Of course, it's by no means the same story as Waid began to tell, but there are some parallels. Fortier's story opened with an older, retired Britt Reid narrating the story, and so did Waid's. I believe this is exactly what Waid intended at the start, but he changed his mind sometime after three quarters of the series had been published. Agreed. Casey seemed to go crazy without much warning. Did anybody notice that GH was hit over the head with a telephone for the second time in this series? Maybe he has a weakness to telephones. Now that I think about it, the bit with Lenore Case going off the deep end seems a little contrived, and not foreshadowed in any way by her previous behavior. 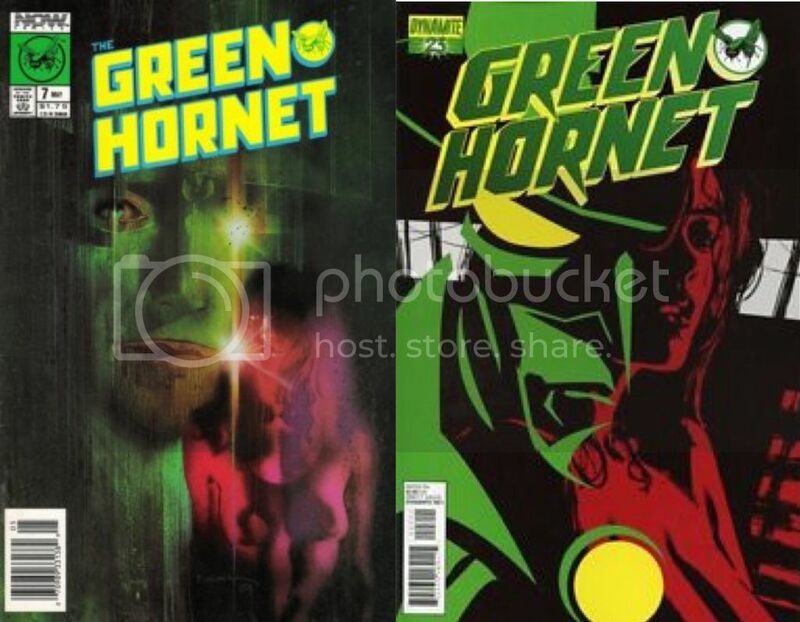 It occurs to me that Mark Waid may originally have intended to tell a story in which the Hornet and Kato DID retire (due to all the unforeseen negative consequences of Britt's actions), and then changed his mind (due to the choice being forced upon him by falling sales) in a way that is kind of a cry for help from the readers to demand more GH stories from DE. If this is indeed the end for the Green Hornet at DE, I wonder if an actual end to the Hornet's career wouldn't have made a more satisfactory ending to this series after all. I agree. The last issue seemed a bit forced. We had a glimpse of Case enjoying the action of being a hero a couple of issues back, but this seems like a real leap. Even if GH and Kato retired, Dynamite could always invent a crisis to bring them back. I really wonder if Waid's intention was to have them retire and there were creative differences with Dynamite? This is pure conjecture, but I wonder if this ending and fact Waid's Doctor Spektor only going for four issues are somehow connected. Both are great titles. I wonder if there was a disagreement on ending of GH and that spilled over into Spektor? Wow what a great series. In my opinion, this was tied for Dynamite's best pulp comic so far (with shadow: year one and GH: year one). I loved the last issue, especially the last three pages. Let's roll, Kato. Thought I'd post a couple of photos of the radio cast. Britt Reid, Kato and Miss. Case and Mike Axford.